All overnight resort guests receive complimentary daycare access on the day of check in and through the day of checkout. We, at Chino Hills Animal Hospital, are not an animal hospital; therefore, we cannot diagnose or prescribe any diagnosis or medication to your pet. 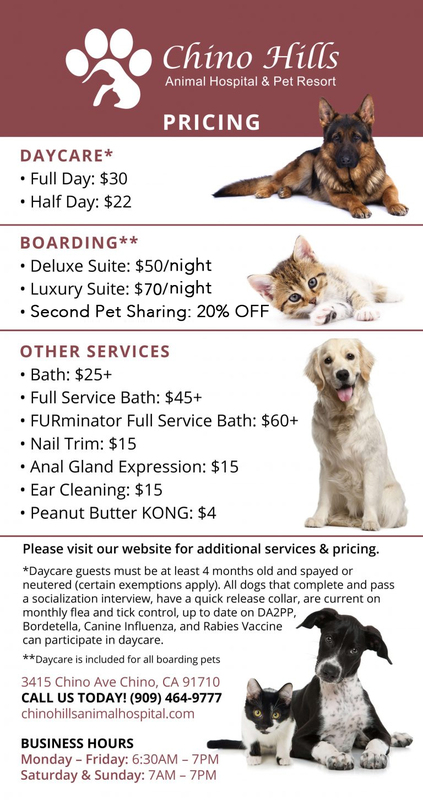 In the event your pet is in need of medical attention, our neighbors at Chino Hills Animal Hospital will administer the appropriate medical care, in a timely manner per your prior consent.